Well, I'm back for part two of my impressions on the newest entries to the PS3 "Greatest Hits" library. I hope you enjoyed part one where I discussed my take on Devil May Cry 4, Gran Turismo 5 Prologue and Metal Gear Solid 4: Guns of the Patriots. 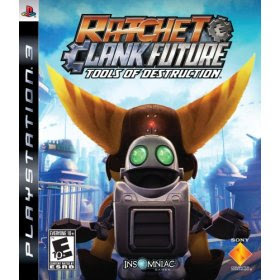 Today I'm going to be tackling some more critically acclaimed PS3 games to land in the "Greatest Hits" library, including Army of Two, Battlefield: Bad Company, and Ratchet and Clank Future: Tools of Destruction. It would certainly be cool to have a Greatest Hits version of Valkyria Chronicles, but I certainly have my doubts we'll ever see this. The game has sold roughly half a million copies across North America, Japan and Europe which does meet the bare minimum requirements for a Greatest Hit. I just think the game is too niche and doesn't have mainstream appeal. Which is a shame because it's one of the best damned RPGs I've played this entire generation.